Here at Old Westminster, we are passionate believers in tradition and innovation - in combining these two contrasting perspectives we get to exercise our experimental creativity... and that keeps us excited. We pride ourselves on creating beautiful, unique, and flavorful wines that embody timeless tradition infused with modern-day, new-world flair. With that being said, we’d like to introduce you to the newest, old-school toy here at OW: the amphora. An amphora is a type of vessel that dates back as early as the Neolithic Period and is characterized by its size and shape (a small base, large, cylindrical body, and elongated spout) and two large handles. Traditionally, amphorae are handspun on large pottery wheels and are made of terra cotta (clay-based), giving them a strong red/brown/orange color. During the amphora production process, the body of the vessel is spun first then left to dry. Once dry, large coils of clay are added to form the neck, rim and handles. With all the details complete, the porous vessel is ready for the makers use. Amphorae have historically been used to transport various products - both liquid and dry - but have most popularly been used for wine (we think for good reason). The vessel assists in the fermentation and aging process for both red and white wines and can be buried in the ground to help regulate the overall temperature. Clay vessels of all kinds were the golden standard of winemaking in ancient Rome and Greece - not only because it predated wooden storage, but also because clay was easy to produce and took less time to create than wood. While clay vessels have many positive attributes. Wine Folly explains amphorae beautifully: “The porosity of the clay increases the oxygen exposure to wines while they age. Oxygen accelerates flavor development which includes softening tannins and increasing aromas of nuts, baked fruit, and chocolate.” However, the negative attributes of the amphorae ultimately lead to its downfall - its overall weight and breakability made it increasingly impractical to transport as trade developed and increased. With that, the age of resilient wooden barrels was born. Wooden barrels, especially oak, became more and more popular over the centuries not only because of their strength and transportability, but because of the flavors and tannins the oak brought to the wines that it carried. Oak wood is made up of a multitude of complex chemical compounds - each contributing flavor or textural notes to red and white wines. It’s by aging wines in oak barrels that you are able to experience flavors of vanilla, tea, tobacco and the textural “mouth feel” of hydrolysable tannins. So why bring back the use of an amphora? Well, because great wine is the sum of many details. 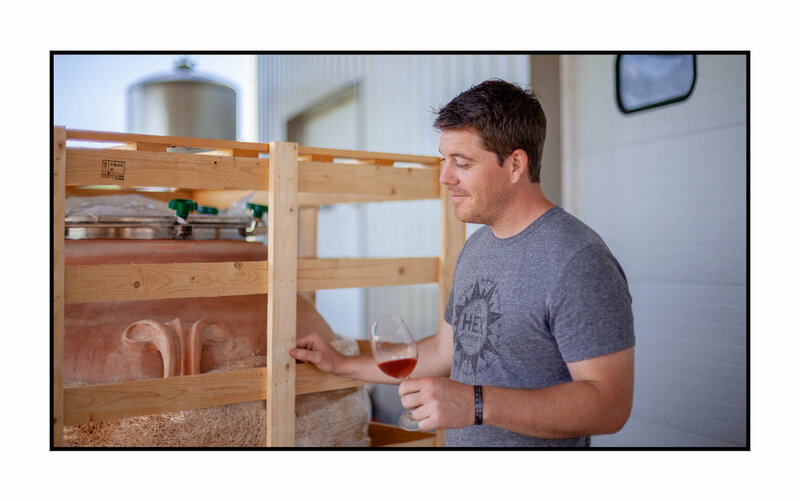 Not a simple linear sequence: farming, fermentation, aging, and bottling. We are peering deeper into the sequence to find more... history, innovation, context. To our minds, this amphora is a tool in that continuum. We can't help but get excited thinking about how this 200-gallon clay vessel that we'll be fermenting fruit in this fall is just how the Etruscan's would have made wine in the 7th century BC! What are we going to be making, you might ask? The answer is: Ramato! That is, skin-contact Pinot Grigio. When we say Pinot Grigio, many of you are picturing a straightforward white wine. However, Pinot Grigio has grey/copper colored skins which, when the juice is soaked with the skins, gives the wine a deep amber color. How many of you have tasted our Alius, or Seeds & Skins? Italian winemakers have used Pinot Grigio to make Ramato in amphora for millenia. This project is a perfect way for us to put a modern, local spin on an ancient tradition. And we're excited to do just that.